BHEALED - Science of Reconnection Reconnective Healing elicits great interest from top doctors and medical researchers at hospitals, colleges and universities worldwide. To date, these include: • Jackson Memorial Hospital• UCLA• ﻿Cedars-Sinai Medical Center• ﻿The VA Hospital• ﻿University of Minnesota• ﻿Quality of Life Research Centre (Copenhagen)• ﻿Memorial Hospital (Istanbul)• ﻿RMIT University (Melbourne)• ﻿Parker College (Dallas, TX and Melbourne, Australia)• ﻿St Petersburg State Technical University (St Petersburg)• ﻿The University of Oslo (Norway) Reserchers: William A Tiller, Ph.D.Dr. Tiller's work with Reconnective Healing is further discussed in his latest book, Psychoenergetic Science: A Second Copernican-Scale Revolution.Konstantin Korotkov, Ph.D.Gary E. Schwartz, Ph.D.Mark O’Connell, M.D. Reconnective Healing elicits great interest from top doctors and medical researchers at hospitals, colleges and universities worldwide. Dr. Tiller's work with Reconnective Healing is further discussed in his latest book, Psychoenergetic Science: A Second Copernican-Scale Revolution. Below is a Kirlian photograph taken in 1998 at a research facility of Dr. Pearl's right hand. 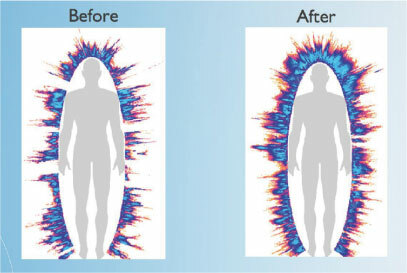 Bioenergy field of a Russian athlete before and after a Reconnective Healing session. On average, each athlete's bio-energy field improved 17% or more, and balance improved, as well as brain symmetry. William Tiller, PhD Professor Emeritus of Stanford University’s Department of Materials Science, Fellow of the American Academy for the Advancement of Science and star of the recent What the Bleep films. Interestingly, we now know that the body heals through frequency, vibration and resonance and it’s communicated through light. So the fact the Reconnective frequencies contain an element of light is very significant. In 1970, a German scientist, Fritz-Albert Popp made an interesting discovery while researching causes of cancer, that our DNA emits a certain level light and that it uses frequencies of every variety as an information tool, which suggests that the body’s biofeedback system depends on light waves. He found that the light was responsible for photo repair of cells, and carcinogens cause cancer because they permanently block this light and scramble it so the photo repair can no longer work. When we are ill, our light waves are out of synch. Further info in "The Field" by Lynne McTaggart. Dr Tiller continues: "We did an experiment with one of Eric's healing workshops in Sedona last February and the data that we gathered was quite remarkable. First of all, we found that when we started monitoring the room, which was about five hours before anyone – any of Eric's crew, or Eric himself, or the healees [sic] – ever came into the room, we measured a higher gauge symmetry state than in normal reality. It was already a conditioned space! So something had happened before people even gathered. That space was set up, and that made it easy then for healers to work. Papers on his energy healing work, including distance healing, can be found at www.tiller.org His work with Reconnective Healing is discussed in his latest book, Psychoenergetic Science: A Second Copernican-Scale Revolution.